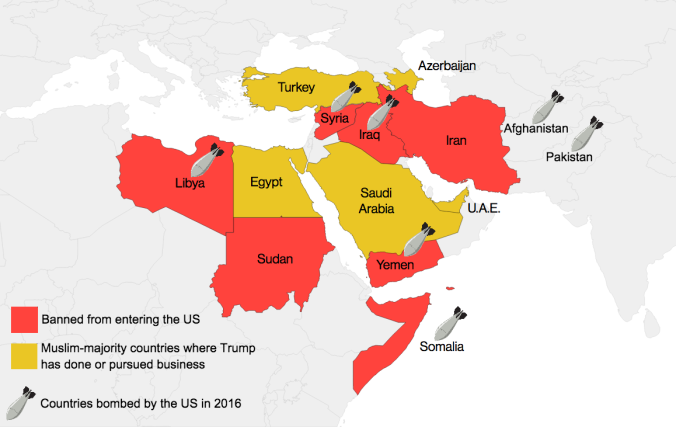 In attempt to overshadow the true reasoning and motive behind the executive order that Donald Trump has imposed, his administration as well as his supporters claim that this executive order is for the benefit of the country. He claims that he is protecting the country from “terrorists.” But when looking at these statistics that Kim Kardashian posted on Twitter, we see that maybe we need to shift our focus to another threatening killer, instead of discriminating against Muslims. President Trump has hopes of deporting the 11 million undocumented immigrants living in this country. He has made statements about deporting Mexican immigrants that are racist and bigoted. “When Mexico sends its people, they’re not sending their best. … They’re sending people that have lots of problems, and they’re bringing those problems with us. They’re bringing drugs. They’re bringing crime. They’re rapists. And some, I assume, are good people,” said Trump in a 2015 speech. Not only is it racist and ridiculous to deport all of the undocumented immigrants living and working in the United States, it is fiscally impossible. One of Trump’s consistent arguments throughout his campaign was that he plans to cut taxes without increasing the deficit; however, his immigration plan will do the opposite. The Center for American Progress (CAP) did a study that found that it would cost the U.S. $200 billion to deport all 11 million of the undocumented immigrants, and then another $200 billion to keep them out. This is just the cost of deporting the immigrants, and does not include the cost of the wall Trump is planning to build on the southern border. The wall on the southern border, near Mexico, would also cost an exponentially large amount of money that is not feasible for the U.S.. Trump himself estimated that the wall would cost around $10 billion. However, the Washington Post fact checked Trump and found that wall would actually cost $25 billion. Where is this money going to come from? Who is going to pay for the wall because Mexico has made it clear they won’t? And how are taxes going to be cut, while spending on immigration exponentially increases? A Pew Research study found that 62 percent of people would oppose a wall on the border of Mexico. The study also found that 70 percent of people think that the U.S. would end up paying for the wall that Trump claims Mexico will pay for. Overall, it is fiscally impossible to deport all 11 million of the undocumented immigrants living in the U.S.. Even if you take out the factor that President Trump is being racist, he has no plan as to how any of this would be paid for.